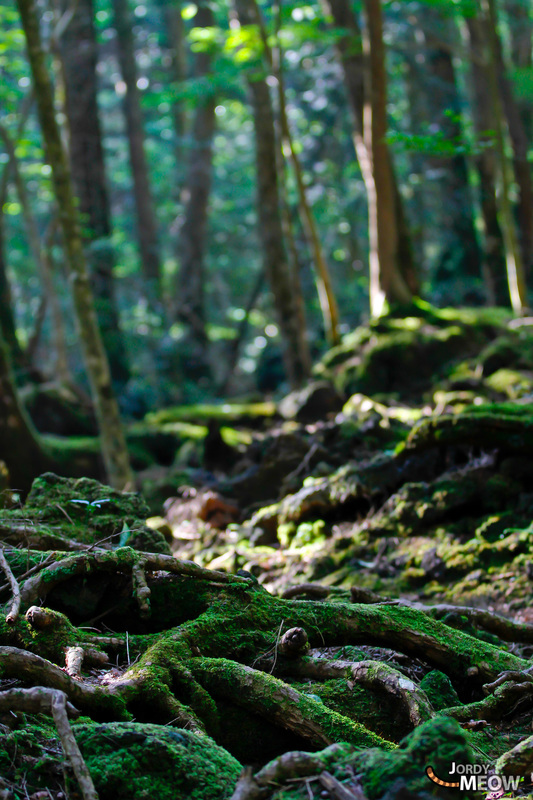 Aokigahara, known as Japan’s suicide forest, is a unique place in other ways. Silent, no wildlife in sight, magnificent trees and shrubs, and really easy to lose yourself in. Curious to discover more, we set off to see for ourselves. The floor of the forest in the shadow of Mount Fuji has been nourished by a thick layer of lava over thousands of years. 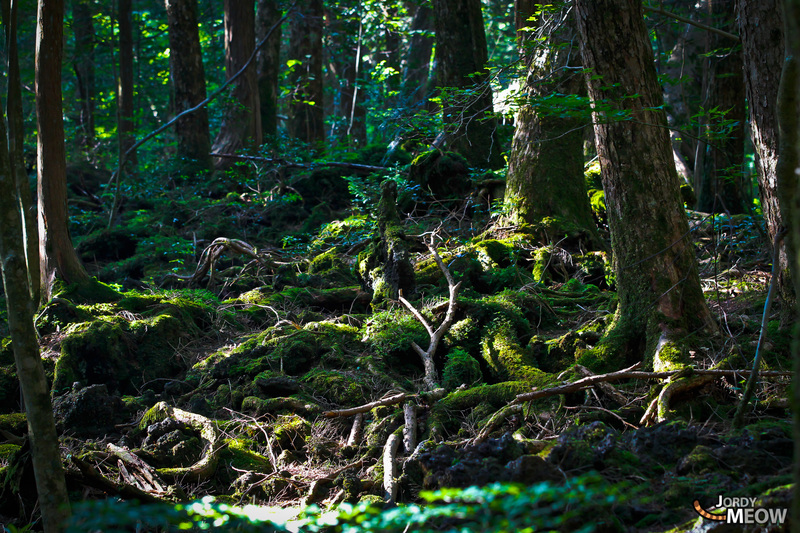 Aokigahara has grown along with the caves formed by volcanic eruptions. For anyone wanting to commit suicide in Japan, this forest is the obvious place. But why? Because it’s gloomy? Or because of the dreadful stories told about it? 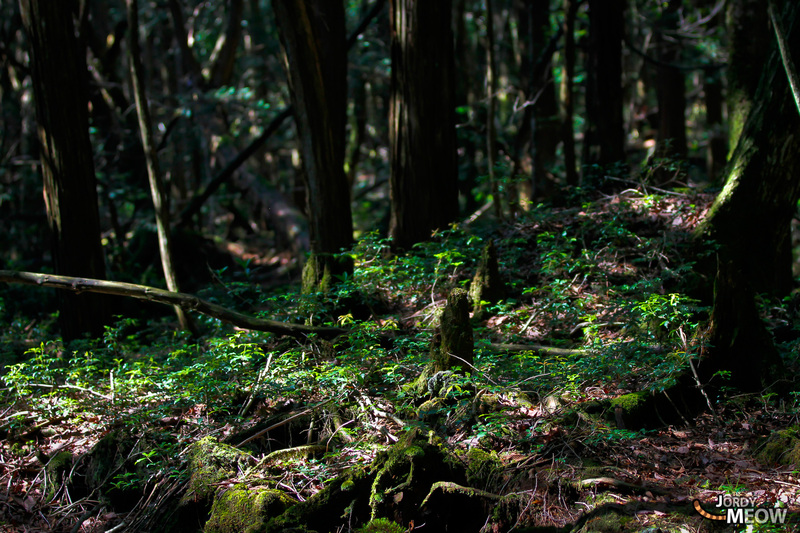 The Aokigahara forest, also known as Jukai (Sea of Trees), qualifies on both counts. To avoid getting lost from the start, we head for the main entrance. The few visitors quickly disappear along the trail towards the caves, leaving us in the greatest peace. No sound of insects. Only an uncomfortable heat rising from the ground, as if lava was still flowing below the surface. These caves have been developed as tourist attractions, while the forest has become known as the best spot to commit suicide. One book that has contributed to its notoriety is The Complete Manual of Suicide. And there’s also the fine novel Tower of Waves (Nami no Tou). The suicide manual objectively rates different ways of ending your life. And the idea of giving up your soul to Aokigahara is highly valued by both the author and his readers. The novel is a sad story of the love between a married woman and a younger attorney, which ends in peace at Aokigahara. Rich with a magical atmosphere around an impossible love, their story aroused compassion. The influence is obvious. Many of the bodies found in Aokigahara have these books lying beside them. We carry on down the same track, past another entrance a little further along, rather less official this time: Entry prohibited. A second notice reads Security camera. 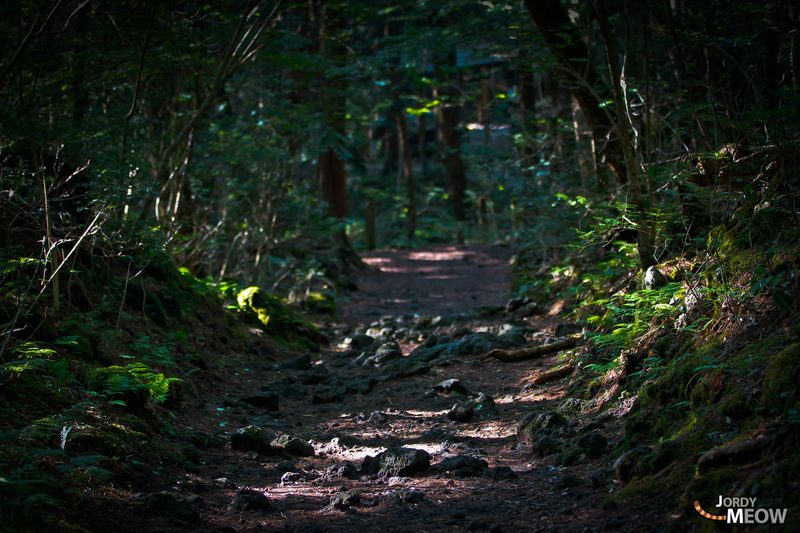 Welcome to the forbidden forest of Aokigahara! Patrolling the 10 metres inside the forbidden zone are guards with a huge dog at their heels. They’ve spotted us too, no doubt. Probably more interested in anybody that isn’t moving, they ignore us. There’s a bike parked further along. The trail ends here. We now enter the real Sea of Trees, and soon begin to find strips of plastic tape attached to the trees. Just here, two parallel strips, carefully marking a common road to hell. This forest, this Sea of Trees, is like no other. The density of the canopy blocks the sunlight and the wind. And these tapes suggest the worst, like the pebbles dropped by Tom Thumb to avoid getting lost (and in Aokigahara, to backtrack, just in case you change your mind). We follow them. At first, it’s an easy walk, nothing very unusual except a chilling silence and the same stifling heat from the ground. We come to a crossroads of pieces of tape and string of all colours, branching in different directions. We follow separate tracks, while keeping one another in sight. The tranquil walk becomes more complicated. The forest floor turns into a web of intermingled roots, rocks and dead leaves. It’d be too easy to fall into the holes hidden by this undergrowth, to stumble on the rocks and find yourself bogged down. Nevertheless the marker tape continues, there seems no end to it. Would-be suicides are clearly not phased by these obstacles. As we plunge deeper into the forest the markers become less clear, rather as if whoever had attached them had lost patience and now just trail them haphazardly along the ground. Sometimes they disappear, only to reappear a few metres further along; or find themselves wrapped round and round a tree trunk; or else are completely abandoned. Are they scared, hesitant? Impossible not to share their emotions. Bits and pieces appear on the ground, leftovers from another age. Some people camp out at Aokigahara, as suggested by the author of the suicide manual. In order to meditate on their lives and of course also on their final act. The trails are more and more difficult to follow. Some tapes go in one direction, others in totally opposite directions. So we start to follow a different tape. Then another. It’s impossible to know where the trails end, or if others start, in the shambles of coloured tape and string. After a long, meaningless trek of almost three hours, we decide to turn back. We don’t agree on the direction of the track, but having lived all my childhood in the forest I trust my instincts. Think I can find the way back. Retracing our steps is difficult, the light gradually failing. My friend tries to reassure herself that she hasn’t after all fallen on someone, which would have been extremely traumatic. Then at this very moment we see something. A piece of string around a tree, with a man’s tie, forming a perfect loop. A few metres away, another tree, with a similar string. Except this time, it’s attached to a woman’s belt. A couple? But then, why the distance between them? Lovers separated despite the strength of their feelings? Are they the same ones we followed at the beginning? There’s no clue. On the way back, I think about the documentary I’d seen on Aokigahara. It explained that those who mark their tracks through the forest are those who are still hesitating. I wonder if some of them have returned and how they must feel. We reach the entrance. At the drinks machine, we buy a can of coke. The coin drops, the machinery moves, the familiar clatter. The can drops. The taste of coke, and you ask yourself: but why choose this? It’s too sweet! We smile. We head back to the car. There’s another car in the parking lot, abandoned. I glance in the windows: mangas, magazines, some dated a few months ago. We get in my car, I start the engine. Good to be alive. Back to Tokyo. 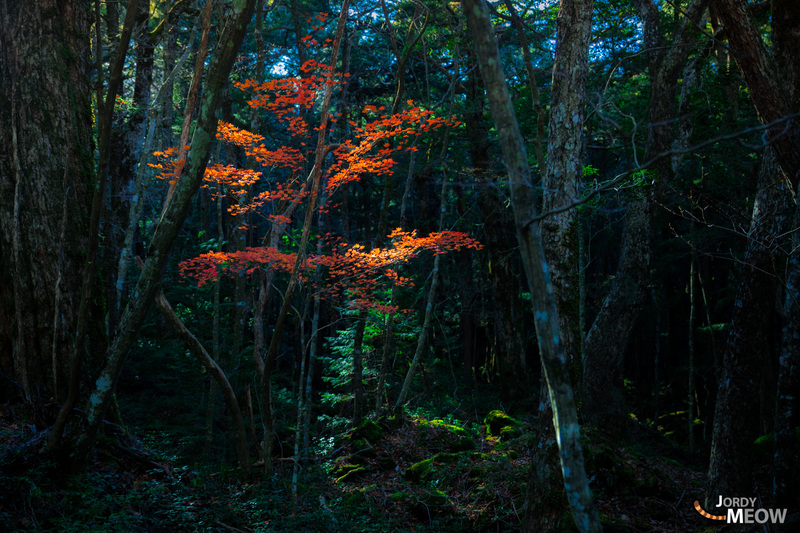 For other stunning forests, check out my articles on Bijin Bayashi: The Forest of Pretty Women; or The Giant Maple Tree of Oihara, and finally, if you’re looking for atmosphere: The Royal House, An Abandoned House.